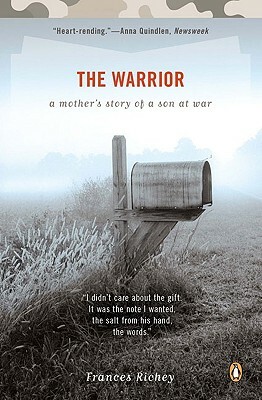 When Frances Richey's only child, Ben, a graduate of the United States Military Academy at West Point and a Green Beret, went on the first of his two deployments to Iraq, she began to write the twenty-eight unflinching poems that make up The Warrior. This urgent and intensely personal collection describes the world of those who wait while their loved ones are in combat or perilous situations; it is universal in its expression of the longing, anguish, love, and hope that constitute close relationships. Frances Richey was born in Williamson, West Virginia and grew up in Charleston, WV. She is a graduate of the University of Kentucky. After working in the business world for almost two decades, she left to teach yoga and write. She is the author of one previous collection of poetry, The Burning Point, which won the White Pine Press Poetry Prize and was released in 2004. "Even if you don't have a son fighting in Iraq, even if you don't read poetry, even if you think you are immune to the power of a mother's lament-pick up this book and read it right away." "Powerful . . . authenticity burns in every line." "A lifeline across a deadly chasm for every reader."